At The Vision Lab we believe great employee ideas can come from any level within your organization, we help leaders tap into this collective wisdom. This short video will help explain how companies gather ideas from employees by using new techniques like machine learning and NLP to prioritize this feedback at scale. 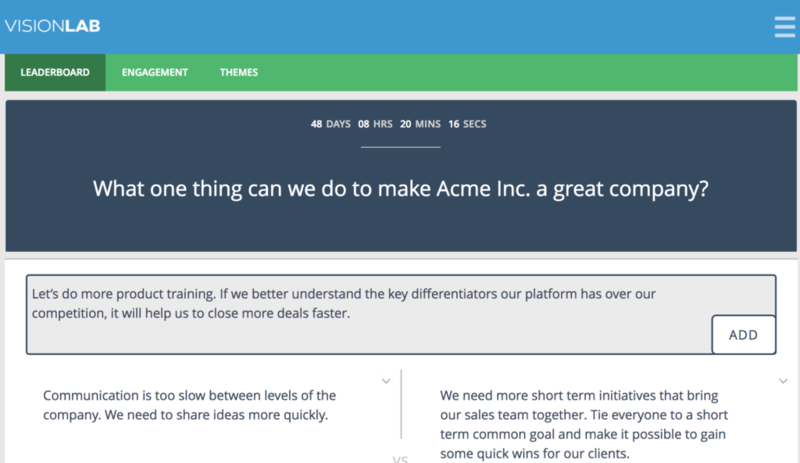 Employees submit ideas anonymously, and are allowed to contribute as many ideas as they like. Leaders realize employees are really busy, so the goal is to capture votes and employee ideas as fast as possible by any means – mobile, laptop or tablet. 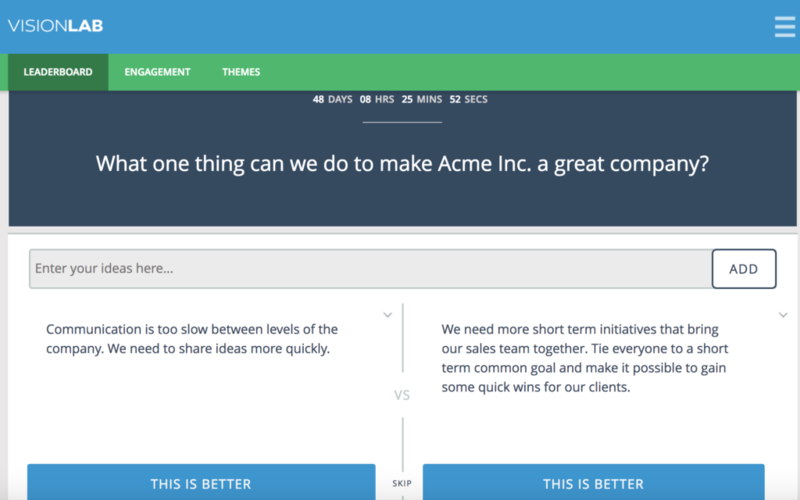 The platform present employees with a binary decision, forcing them to choose between two ideas. All of these ideas have been submitted anonymously by their fellow employees. By forcing them to choose the idea they think is better, it allows us to create a ranked listing of winning ideas using probability. Ideas are refreshed with new choices, but we only need five to ten votes from an employee to get the data we need. They don’t need to vote on every single idea. 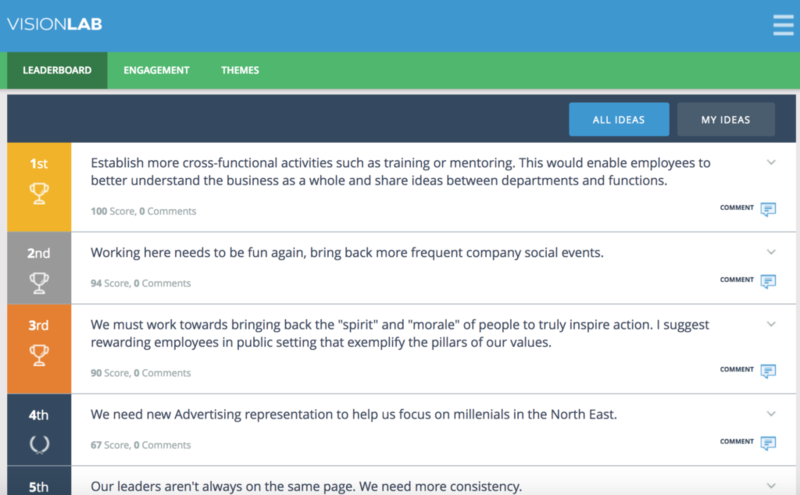 The leaderboard changes in real time as thousands of employees across the world vote and comment on their peers ideas. Employees can vote as many times as they wish, the more votes the more accurate the results. Gathering ideas from people in their own words is tough. It can be challenging to nail down what specific theme employees are focused on. But now, by using new methods such as NLP and machine learning we can analyze what contributors are writing and identify its theme. 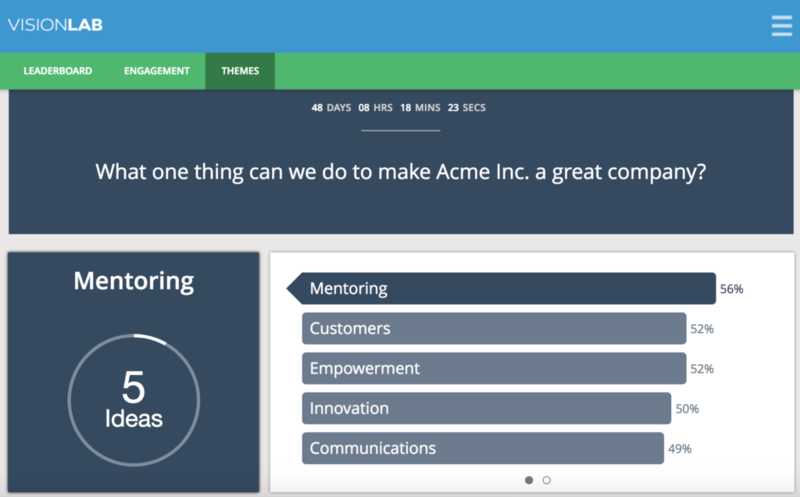 Here you can see employees, when asked to give ideas to improve Acme Inc. have identified major themes such as mentoring, customer growth and employee empowerment ideas. All organized and ranked below the themes. 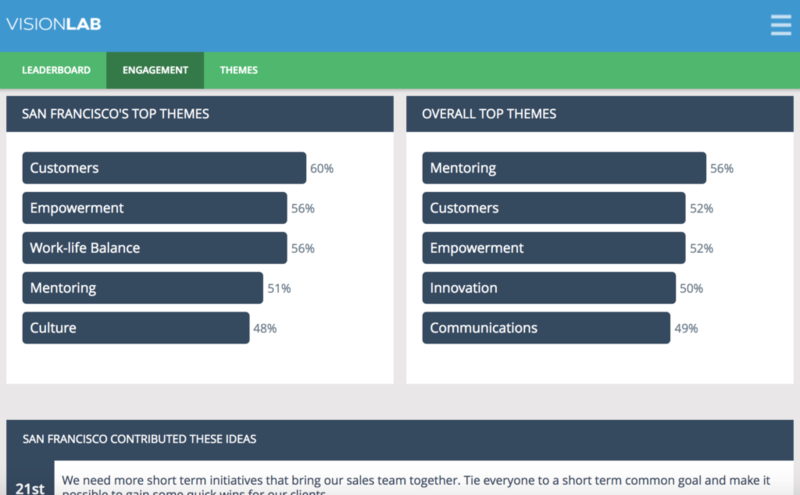 These themes are ranked not on the volume of ideas, but rather prioritized based on employee voting. So we are effectively crowdsourcing and prioritizing employee ideas by using the collective intelligence of internal experts – your employees. But we can go even further. By understanding the demographics of employees, we can analyze themes based on a wide array of factors. For example, we can look into a specific office – San Francisco, and understand which themes are most important in this office versus the overall organization. We can also understand what ideas San francisco has both contributed and voted for. This analysis can be done by rank, gender, department or region depending on the leadership priority. All while maintaining individual employee anonymity. So in conclusion, all of these deep insights and prioritized actions for leadership teams, can be gathered in a fast, simple way, without disrupting employees. In as little as 30 seconds we can understand what the tens of thousand of company employees think, and what actions they think should be prioritized. That is how using a mixture of crowdsourcing, machine learning and NLP gets to deeper faster insights and why companies will start to move away from more traditional annual surveying methods. A live demo of the TVL platform is here and some tips to overcoming survey fatigue is a useful start to review here . For further information on how we help companies, feel free to reach out to trevor@thevisionlab.com for my personal help.